Globalisation offers many benefits, some of which cannot be separated from other types of policy. This column examines how the benefits from removing regulations that impede competition are partly contingent on openness to import competition. Using recent firm-level analyses of productivity growth, it argues that those firms that contribute the most to overall growth could also be held back by reduced openness, harming overall advances in incomes. Enthusiasm for reducing domestic regulation, or ‘red tape’, has been gaining momentum in some OECD countries, and there are many reasons to think that reducing such red tape – including at local levels – could be beneficial for productivity growth by encouraging firm entry, competition, and efficiency gains. Evidence from an analysis of firms and industries in panels across OECD countries suggests that this is indeed the case (OECD 2017). Easing the strictness of regulation in network industries (e.g. energy, telecommunications, and transport) especially, as well as in retail and professional services, would improve productivity and competitiveness in downstream sectors, not least manufacturing, which use services from these upstream industries as inputs for their own production. This ‘knock-on’ effect of regulation in upstream industries on manufacturing through input-output linkages is particularly strong (Bourlès et al. 2013). Furthermore, such product market reforms would put greater emphasis on new firm entry as a means to strengthen competition, encouraging incumbents to increase innovation efforts to protect their market shares. In light of these economic gains, countries have, step-by-step, removed obsolete or badly designed regulations in product markets over the past decades, reducing state involvement in business sectors, making it easier for entrepreneurs to start businesses and expand, and facilitating the entry of foreign products and firms. While in some cases regulation was largely removed, in others it was replaced by better-designed legislation that can even help to enhance competition (OECD 2014). However, recent discussions have focused on whether limiting imports – meaning also reducing import competition – could help domestic firms and workers. On the contrary, the economics literature finds that competition and the entry of new firms strengthens efficiency by providing incumbents with incentives to innovate to maintain their market position (Aghion and Howitt 2008). And a recent OECD analysis finds no upside to increasing protection, as a quarter of jobs depend on foreign demand (OECD 2016). The prospect of a trade war is one that would likely involve primarily casualties, as well as heavily weakened innovation incentives. Moreover, one aspect that has not been discussed widely in this debate is that, through enhanced import competition, an important part of the benefits of deregulation can be most effectively realised. In a recent paper that examines the productivity growth of firms in a dozen or so OECD countries, we find that the benefits of domestic deregulation depend both on sectoral openness to imports and firms’ technological advancement (Ben Yahmed and Dougherty 2017). The results show that firms in sectors with higher import penetration have higher productivity growth, if these firms are close to their sectoral technology frontier. The most productive firms appear to enjoy a significant increase in productivity when foreign competitors’ pressure is high; in contrast, import penetration does not incentivise firms far away from the technological frontier, or if so only weakly. In addition, the pro-competitive effect of international trade depends on domestic regulatory stringency. Our results indicate that, among the most productive firms, the positive effect of foreign competition is inhibited for firms operating in a country with stringent regulation such as higher barriers to entry. Domestic and foreign competitive pressures are found to be complementary: firms’ incentives or abilities to improve their productivity to cope with foreign competition are stronger in countries with less stringent regulation. 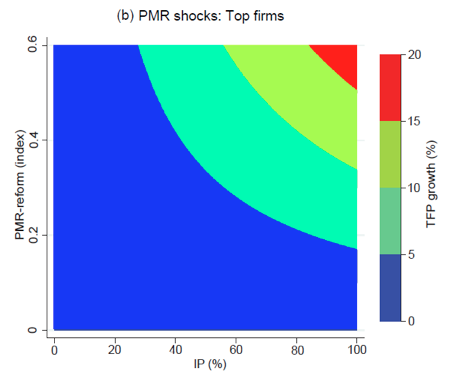 As for firms at the bottom of the productivity distribution, foreign competition does not have a significant benefit on their efficiency – irrespective of the regulatory environment – although it may facilitate their demise, whereby they relinquish their market share to more productive firms. 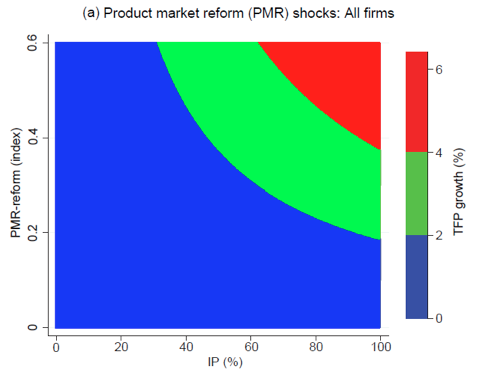 We carried out a simulation for a range of product market regulation reforms, conditional on the level of import penetration (IP) in a firm's sector (Figure 1). We use an indicator of de jure domestic regulations on a 0–6 scale reflecting the extent to which the regulations inhibit competition. Product market regulation reforms unambiguously boost productivity growth; however, their effects are magnified considerably when import penetration is higher. For instance, a reform that reduces the index by 10% from the median setting of 2.39 (out of 6) would boost firm productivity growth by 0.5% annually in a sector with an import penetration of 20% (the 25th percentile of sectoral import penetration), and by 2.3% in a sector with an import penetration of 88% (the 75th percentile). Again, the impact is driven by firms in the upper half of the global productivity distribution in their sector. For these top-performing firms, productivity growth is boosted by 1.4% and 6.3% per year in low- and high-import penetration sectors, respectively. For firms in the lower half of the productivity distribution, the impact of reform through this channel is almost negligible. Countries with a large share of high-productivity firms will thus benefit much more from product market regulation reforms, especially if they remain open to trade. Source: Ben Yahmed and Dougherty (2017). Openness to imports provides an opportunity to improve firm productivity. However, we show that only some firms benefit from it, and the gains vary across countries (with different regulatory environments). While market selection of the most productive firms is a source of overall efficiency gains, the losses or exit of less efficient firms generates adverse effects on the labour market. It is thus a good strategy to enable more firms, big and small, to make the most of it through framework and innovation policies that would help to reduce the technological gaps across firms. Recent analysis by the OECD has shown that there is a systematic divergence in productivity gains across firms and sectors, driven by weaknesses in the diffusion of technology across firms (OECD 2015). Much of the so-called ‘hollowing out’ of the manufacturing sector in OECD economies is for the most part driven by technological factors, rather than driven by trade policies (Baldwin 2017), and the solutions are more likely to involve innovation, education and skills-related policies rather than trade policy restrictions. In summary, our analysis offers a fresh view of the effect of import penetration on firm-level productivity growth, taking into account firms’ position with respect to the global technological frontier and country differences in regulation. We find that without a high degree of openness to imports, the benefits of domestic deregulation are diminished substantially. Moreover, these benefits are extraordinary for leading firms, who can gain many times more than laggard firms through this ‘multiplicative’ channel. Firms in the lower half of the distribution gain much less, regardless of the context. These firms contribute relatively little to overall productivity growth, although they do contribute to employment. More importantly, while it may seem that ‘toying with globalisation’ may not be risky, the effects could be outsized for those very firms which have led the overall growth in our economies in recent decades (OECD 2015). Authors’ note: The opinions expressed and arguments employed above are solely those of the authors and do not necessarily reflect the official views of the OECD or its member countries. Aghion P and P Howitt (2008), The Economics of Growth, Cambridge, MA: MIT Press. Baldwin, R (2017), "Factory-Free Europe? A Two Unbundlings Perspective on Europe’s 20th Century Manufacturing Miracle and 21st Century Manufacturing Malaise", in L Fontagné and A Harrison (eds. ), The Factory-Free Economy. Outsourcing, Servitization, and the Future of Industry, Oxford University Press. Ben Yahmed, S and S Dougherty (2017), "Domestic Regulation, Import Penetration and Firm-level Productivity Growth", Journal of International Trade & Economic Development. Bourlès, R., G. Cette, J. Lopez, J. Mairesse, and G. Nicoletti (2013), "Do Product Market Regulations in Upstream Sectors Curb Productivity Growth? Panel Data Evidence for OECD Countries", Review of Economics and Statistics 95(5). OECD (2015), The Future of Productivity, Paris: OECD Publishing. OECD (2014, 2017), Going for Growth: Economic Policy Reforms, Paris: OECD Publishing. OECD (2016), OECD Economic Outlook No. 100, Paris: OECD Publishing.